Now that it’s September, it is finally acceptable to start celebrating fall! From apple cider and chilly evenings to pumpkins and falling leaves, I love everything about fall. The thing I always notice the most about the fall is how the season smells. There’s just something about the smell of fall that is absolutely irresistible. I guess that’s why candle and fragrance companies seem to advertise so heavily in the fall. Everywhere I go I see advertisements for fall air fresheners and candles. However, many of these products contain harsh chemicals (also known as VOCs) that are dangerous for you to breathe. VOCs can cause a number of problems from respiratory irritation to allergies and even headaches. 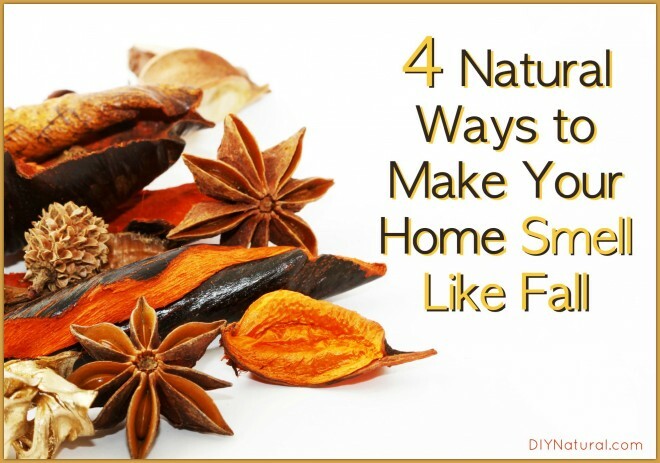 So I say, why not bring fall into your home the NATURAL way? These recipes are quick, easy, and will save you a lot of money. But above all, they are safe and natural, so you can breathe easy, literally! This one is really easy! Once you have all the ingredients, it will take you a total of 5 minutes to mix up. You can find most of the ingredients for this recipe in your local craft shop or even in the spice isles of your grocery store. Bonus: the ingredients of this potpourri make a gorgeous centerpiece or decoration! Like this recipe? Check out this Homemade Orange Spice Air Freshener Recipe. I love, love, love to use my diffuser. It’s like using a plugin air freshener, but even better. My small diffuser spreads the lovely aroma of essential oils throughout my entire first floor easily. This recipe is no exception. It is spicy, sweet, and just perfect for any fall day. Blend all oils together in a 5 mL amber bottle (find them here). Add 3-4 drops to your diffuser. Looking for more diffuser recipes? Check out this list of 50 Awesome Diffuser Recipes. Simmering pots are a simple way to get your home smelling wonderful with very little effort. Plus, they help to add moisture into the air which will help if you are experiencing a fall cold. This recipe is extra simple. Fill a saucepan with water and bring it to a boil on your stove. Add 2-3 cinnamon sticks to the boiling water and turn the heat down (until the pot is simmering). Let the pot simmer as long as you would like (but be careful to add more water as needed so your pan doesn’t scorch!). I love using essential oils to scent my cleaners. Not only do they add different cleaning properties, but they also smell amazing! The base of this recipe is white vinegar, which is absolutely amazing for cleaning. Want to know why? Learn more here: White Vinegar for Cleaning and so Much More. In this recipe, I’ve added clove essential oil and sweet orange essential oil. Clove essential oil is anti-viral, anti-fungal, and antibacterial while sweet orange essential oil is anti-viral and antibacterial. Combine all ingredients in an 8 ounce spray bottle. Spray on counter tops, in bathrooms, and anywhere that needs cleaning. These are four of my favorite recipes, but I’d love to hear yours. Share your favorite fall recipe in the comments below! I love the recipes you have for Autumn. Do you know of any essential oils that would give a similar scent of apples? I know I can put apples in place of the oranges for simmering but I often forget about it on the stove. Hi Debbie! The only essential oil that smells somewhat fruity that I can think of is black currant essential oil. I doesn’t compare that much to apples, but it is hard to come by and often expensive. Thanks for the fun ideas! Where/how did you become an aromatherapist? That is something I would love to venture into! Hi Angela! I went to the Aromahead Institute (online) but based in NY. It’s a great aromatherapy program and I’d recommend it to anyone. Thanks Joan! This is very good to know.